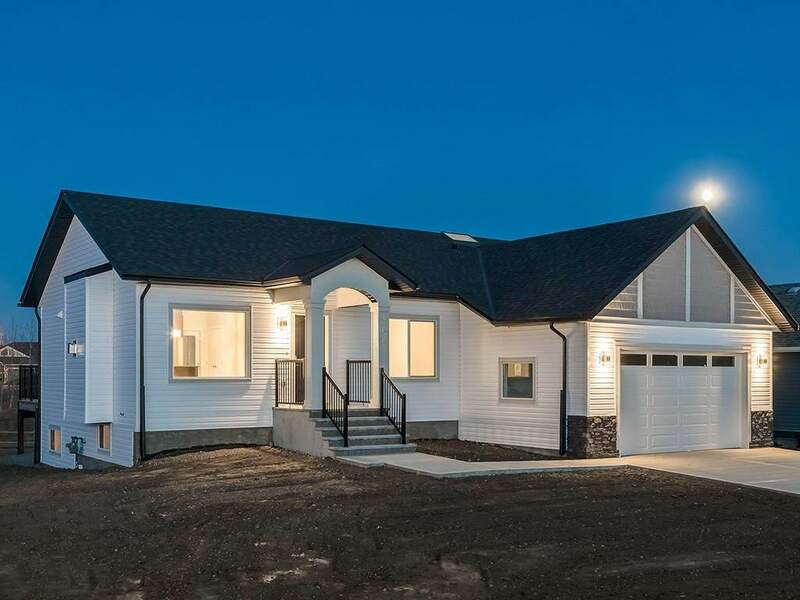 DESCRIPTION ***SELLER WILL CONSIDER TRADES*** ENJOY LIVING the GOLF COURSE LIFESTYLE in SPEARGRASS, w/this BRAND-NEW BUNGALOW w/over 1597 sq ft of TASTEFULLY DEVELOPED LIVING SPACE! SPACIOUS, WELCOMING Entrance w/GORGEOUS warm-toned HARDWOOD floors (w/TILE in baths/mud rm), Living room w/FP + STUNNING Stone mantle, BRIGHT Kitchen w/GRANITE Counter tops, HUGE Island w/EYE-CATCHING light, BEAUTIFUL cabinetry, MATCHING S.S. appliances, WINDOWS over SINK, PRIVATE Dining rm w/COFFERED CEILING, LARGE Master w/4 pc En-Suite including SOAKER TUB, BEAUTIFUL Vanity, + SPACIOUS Walk-In-Closet, 2 add'l Bdrms, 4 pc Main Bath, + Laundry/Mud Rm which leads to the LARGE ATTACHED DOUBLE GARAGE. WALK-OUT Bsmt on to a HUGE 843 SQ MT Lot which BACKS onto the GOLF COURSE. BEAUTIFUL ROLLING VIEWS as FAR AS THE EYE CAN SEE, + a BIG DECK w/BBQ hookup for ENTERTAINING in the BEAUTIFUL SURROUNDINGS! Just 30 mins from CALGARY, + LESS THAN 5 mins to the TOWN OF CARSELAND! WOW! COME SEE what GOLF COURSE LIVING is all ABOUT + FULL HOME WARRANTY! 166 Speargrass Cr, Speargrass, Alberta, MLS® C4214018 T0J 0M0 is a Detached, 3 bedrooms, 2 bathrooms, approximately 1,597 Sq. Ft. Listing price 449,900.00. This property was built in 2017.